Cat evolution made modern cats to have low thirst drive. They have developed the ability to conserve water in their body with an efficient kidney. You may confirm this by looking at their dry feces or by their concentrated urine. But this doesn’t mean that your cat doesn’t need to consume any more water. Cats have different personalities and they even show it simply through their picky way of drinking water. You might have observed cats drinking from a glass left on the table instead of their perfectly clean water bowl. Or swiping off the water condensation from windows like there’s no tomorrow? How about them sipping from the fishbowl? These unusual behaviors leave cat owners confused and frustrated at times. However, there are a few reasons why your cats are not drinking water. Correct these and you can get your cat to drink water. As clean as cats can be, they don’t like their water source to be near their food. This gives them an impression that the water is not clean. People naturally place food and water beside each other but this goes the other way based on cat’s instinct. This instinct came from their wild predecessors which intuitively find their water source away from their prey. They go this far to avoid contaminating it with blood and dirt. Cats also don’t like water bowls placed in a corner or facing the wall. It makes them feel unsafe because when they hunch over the bowls, it makes them vulnerable to attacks especially from a household with multiple cats. Try moving the bowls to another place and away from their food. Who wouldn’t want to drink fresh water daily? The same goes for your cats; they have a strong sense of smell and they can easily detect if the water has been stagnant for hours. They will also again have the impression that it is not clean. The longer it stands out in the open, more dirt and other bacteria might accumulate. Cats love to play in the water so it might turn them off if they see any dirt floating. They do easily get suspicious. They are easily irritated by strange tastes as well. They can easily detect fluorine in tap water because of their sensitive taste buds. If your cat won’t drink tap water, change to using filtered or mineral water. They may find other water sources because some cats don’t like it at room temperature. If they drink straight from the faucet or from condensates, they might like it cooler. If they join you in your warm baths and lick off from there, they might prefer it warm. It will be good to observe the habits of your feline friend so you’ll know where you have to stand. Cats might prefer running water due to their keen sense of hearing, according to Dr. Dreco from Vetstreet. They have a poor depth perception since they have a blind spot in front of their noses. This makes them difficult to perceive a bowl. A running water, on the other hand, would have dripping noises that can be heard well by cats. Moreover, running water may taste better because it is more oxygenated. You might want to invest in a cat water fountain to make your cat drink more instead of turning on your faucet all the time. It’s more fun for your cats as well since they can play with it. It can help you with your water bill too. Believe it or not, the shape and size of your cat bowl can matter! Some cats may be uncomfortable drinking from what they’re using right now. It may be because it’s too narrow and deep that their delicate whiskers touch the sides. Another cat may prefer a water glass, of course. It is good to also have more than one bowl of fresh water around the house for multiple cats in a home. Remember that cats are territorial by nature. They would also assume that their water is contaminated if they see another cat drinking from their bowl. The type of bowl also has an effect on water taste. The use of plastics may impart a weird note to your cat’s water. That is why it is usually recommended to use either a stainless steel or ceramic bowl. Again, it wouldn’t hurt to observe your cats as long as they will be able to consume more water. Just think about the veterinary costs you will face if your cats get dehydrated. A cat’s body is made up of 80% water. This helps in the maintenance of bodily functions and temperature regulation. In summary, it affects all the organs and systems in a cat’s body much like in humans. Dehydration may happen if the cat’s body loses water below the standard. Simultaneously, minerals will be lost together with the water. Causes of dehydration might include increased urination, diarrhea, vomiting, excessive heat or perspiration, blood loss, and high fever as listed by Cat Health. There are signs to look out for if you think your cat is suffering from dehydration. Cats usually have dry mouths, loss of appetite, sunken eyes, lethargic, depressed, elevated heart rate, panting, and the skin’s elasticity has decreased. How to check the skin’s elasticity? First, clasp some skin at the base of your cat’s neck and then release it. If it doesn’t go back to its original appearance or doesn’t spring back straight away, it might be an indication. 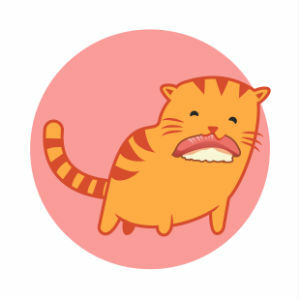 You can also do the tacky gum test where you push your cat’s gum. A white spot will appear and should go back to its pinkish color after 1 – 2 seconds. If it takes longer, you have to seek help from your veterinarian immediately. The treatment for dehydration is to replace the lost fluids in the body. Veterinarians can either dispense it orally or if the cats are vomiting, they might have to give it in another way. It can either be thru intravenous or subcutaneous fluids. Cats usually stay in the hospital for 1 – 2 days if this happens. There are some cats who are more at risk of dehydration than others. Cats that have preexisting conditions such as cancer or kidney issues should be kept on watch. Senior cats are also more prone to dehydration. You have to make some changes if your cat is not drinking at all. 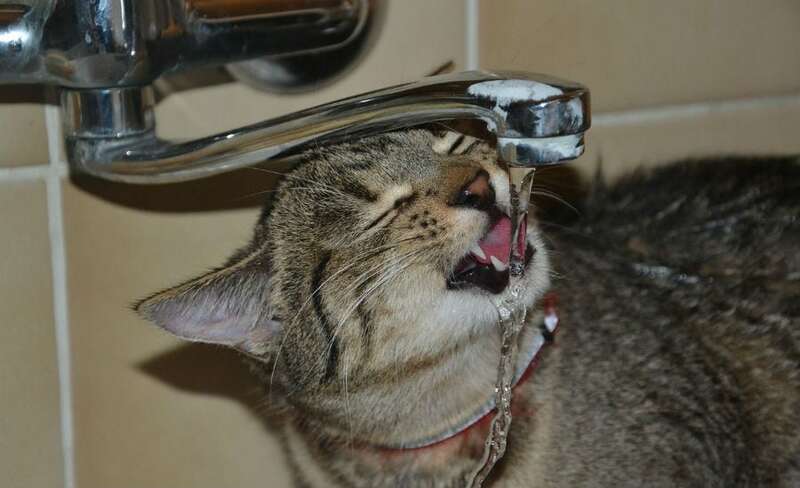 Don’t fret though, as there are some ways that you can encourage your cats to drink more water. If your cat has been eating dry cat food, you would want to switch or add wet cat food into their diet. Since wet food contains 75% – 80% water, this would help it stay hydrated. You may add a spoonful of tuna juice or flavored water into its dry food as an alternative. You can try giving your pet ice cubes on its bowls for lapping up more moisture. You can even try doing tuna or chicken flavored ice cubes for variety. This could add to your cat’s fascination with the sound and appearance of ice cubes. If there are cats that don’t drink water, there are those who do the complete opposite. There are also cats that are drinking too much water. Mindboggling? Yes. Have you encountered any two of these problems yet?